Choose A Goldfish And Find Out When Your Dreams Will Come True! Every single person has dreams and desires! All of us in one way or another are striving for all of them to come true. But only those that come from a pure heart come true. Imagine that you are standing on the shore of a magic pond! The pond is full of goldfishes. They are all very kind and ready to fulfill your requests, but only if they do not harm anyone. Make your wish and catch your fish! Which one is yours? Goldfish listened carefully to your desire and thought. 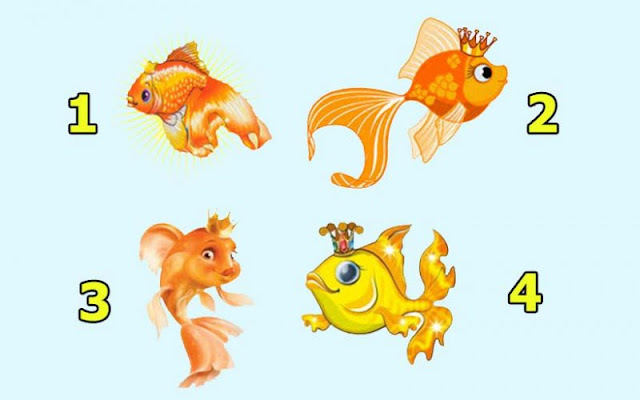 Your fish is the youngest of all goldfishes and doesn't have much strength. But for such a good person like you, she is ready to try. Your wishes will come true in a very unexpected way. So wait! Soon everything will happen! Goldfish listened to your wish, giggled back and wagged her tail. Your wish will come true, but it will take time. If you want your wish to be fulfilled more quickly, you will also be able to make efforts. After all, in the end, fish are also not almighty. You caught a unique fish. She may seem very simple, but she has a unique power. Your desire will fulfill in the very near future. Besides, expect a great joy and happiness in your home soon. Your fish wants to remind you that you already have a lot, but you don't appreciate it. The fish will fulfill your desire, but only partially. You have to do a part of work by yourself. But don't worry. Goldfish promises you a reward for your work.